Sixteen-year-old Alex Ostrovsky downloaded a Cold Play tune on iTunes and scored big-time. It was the one billionth download of Apple popular music service. In honour of the milestone, Apple is giving him an iMac computer with a 20-inch screen, 10 iPods and US$10,000 worth of downloads on iTunes. And they plan to name a Juilliard School scholarship after him. Apple has sold 40 million iPods since they were launched in 2001. Childish. Irresponsible. Hate speech. A provocation just for the sake of provocation. A PR stunt. Critics of 12 cartoons of the prophet Muhammad published in the Danish newspaper Jyllands-Posten have not minced their words. They say that freedom of expression does not imply an endorsement of insulting people’s religious feelings, and besides, they add, the media censor themselves every day. So, please do not teach us a lesson about limitless freedom of speech. I agree that the freedom to publish things doesn’t mean you publish everything. Jyllands-Posten would not publish pornographic images or graphic details of dead bodies; swear words rarely make it into our pages. So we are not fundamentalists in our support for freedom of expression. But the cartoon story is different. The debate about Bloggers versus Journalists has been done to death Get over it. “Typically, the debate about blogs today is framed as a duel to the death between old and new journalism. Many bloggers see themselves as a Web-borne vanguard, striking blows for truth-telling authenticity against the media-monopoly empire. Many newsroom journalists see bloggers as wannabe amateurs badly in need of some skills and some editors. Tesco launched its Internet phone on Jan 19th, a move that will likely bring calls made over broadband to a mass market. Users pay a fixed price for the VoIP phone and a pay-as-you-go rate for all calls made – plus their usual broadband charge. The handset and start-up pack costs £19.97, including £5 of free airtime. Calls from Tesco’s new Internet phone both within the UK and to popular international destinations such as the US, Canada and Australia are priced at just 2p a minute, while calls to UK mobiles cost only 10p a minute. Calls to other internet phone users are absolutely free wherever they are in the world. Retailer DSG international, the parent company of Dixons, Currys, The Link and PC World, launched its own internet call service called Freetalk last year. Similarly, it claimed the move was the beginning of the end for the traditional landline. A Newsweek article suggests that the Tesco move, following in the footsteps of Vonage and Skype, will precipitate a sharp drop in the stocks of big telecoms. Belgium is launching an e-paper test. 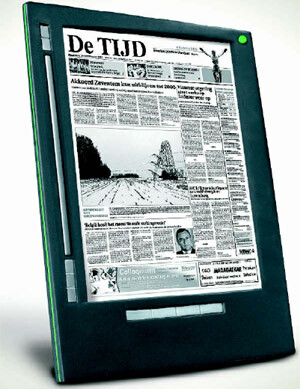 De Tijd, the Antwerp based daily with Belgium’s highest online readership, will be the world’s first paper to launch a digital version, for a three-month trial period beginning in April 2006. The paper will take the form of a portable electronic device – a paper thin screen the size of a newspaper page filled with millions of black and white microcapsules. When an electrical current with data is sent through the screen,these microcapsules form letters that are as sharp as regular newspaper print. The electronic “ink” has 16 levels of grey. When readers flip to the next page or choose a specific article, the particles scramble and rearrange. The pliable screens do not flicker and can therefore be read either indoors or outdoors. Users will connect to the internet with the device and download their newspaper. Updates will be provided throughout the day. Readers will be able to write comments and scribble on the paper by using a special marker. Interactive advertising will also be featured. The electronic newspaper costs an astronomical 400 euros ­ but the first two hundred who sign up for the experiment are not being charged. Based on an estimated use time of three hours per day, the device’s battery would last for a week. The device has a storage capacity of 244 megabytes – the equivalent of a month’s worth of newspapers, 30 books and office documents in different formats. E Ink Corp, a spinoff of the Media Lab at the Massachusetts Institute of Technology, has developed the technology. Dutch company iRex Technologies used the method to build a portable electronic reading device. E Ink is currently working on developing coloured ink. Added video and sound features could take up to 10 years to develop. “If the testing period proves successful, we will draw up a business model based on the analysis,” the project manager Peter Bruynseels told Deutsche Presse-Agentur dpa. 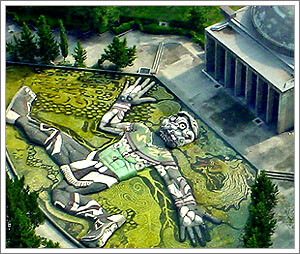 Media experts at Belgian universities will then analyse readers’ evaluations. The Belgian experiment reflects the newspaper’s fight for survival in a world of increasing competition, declining circulation and rising newsprint costs. De Tijd will appear on several screens. “One shows the complete page as in the printed paper, the second lists only the headlines and the third displays the single article,” Bruynseels said. The display is the size of two laptops, but needs 100 times less energy than a normal laptop screen. De Tijd may also publish advertisement corresponding to the time of the day ­ coffee and cereals in the morning, beer and snacks in the evening. Bruynseels says there will also be savings because no paper is being used. Newspapers such as The Times or the Wall Street Journal can go through 200,000 tons of newsprint per year. Rajat Paharia and Sunil Singh based in the Silicon Valley have created an old favourite of mine Asteroids in Flash and are giving it away for free at their site Bunchball. You can post it in your blog and play it directly. Cool. UPDATE: The game somehow crashed Blogger. Too bad. Bugs in the system guys? MindTree Consulting found a novel way to market it’s new chip – on a bindi. An Indian model wears the analog integrated circuit (IC) with intelligent charging capabillities for Lithium-ion batteries pasted on a bindi during a launch ceremony in Bangalore in December. BBC’s Horizon programme suggests the possibility that New Orleans may be the first of many cities worldwide to face extinction. Modern day New Orleans was a city that defied the odds. Built on a mosquito-infested swamp squashed between two vast bodies of water in what is essentially a bowl, its very existence seemed proof of the triumph of engineering over nature. But on the 29 August 2005 New Orleans took a hit from Hurricane Katrina and overnight was turned into a Venice from hell. “If you want New Orleans back you have to do some very fundamental things”, says Professor Penland. “You’re going to have to bring the land back that protects the city from the ravages of hurricanes. If we don’t incorporate that then the city will be faced with extinction. An important study released on Jan. 26 has confirmed what has been known for some time: the people most impacted by the devastation of Hurricane Katrina in New Orleans are African-American and/or indigent. “The Impact of Katrina: Race and Class in Storm-Damaged Neighborhoods” () is a 16-page study headed up by John R. Logan, a sociology professor and director of Spacial Structures in the Social Sciences at Brown University. It raises important questions such as “Whose city will be rebuilt?” Most of the data for this study came from the 2000 U.S. Census and the federal government’s damage assessment maps. One of the main conclusions of the study is that 80 percent of the Black population in New Orleans may not return, either because their homes will not be rebuilt, money to relocate them back to New Orleans is lacking, or they are deciding—or being forced—to stay in other cities. The findings also show that upwards of 50 percent of working class whites might not return either. The bottom line is that if the local ruling class and local and state government officials get their way, New Orleans will be turned into a city catering overwhelmingly to affluent whites and big business. Before Katrina struck the Gulf Coast last August and exposed compromised levees, 70 percent of the close to 487,000 residents of New Orleans were Black. The Jan. 26 study projects that the population could permanently lose 140,000, mainly Black, residents. There doesn’t seem to be any less enthusiasm for Mardi Gras 2006.